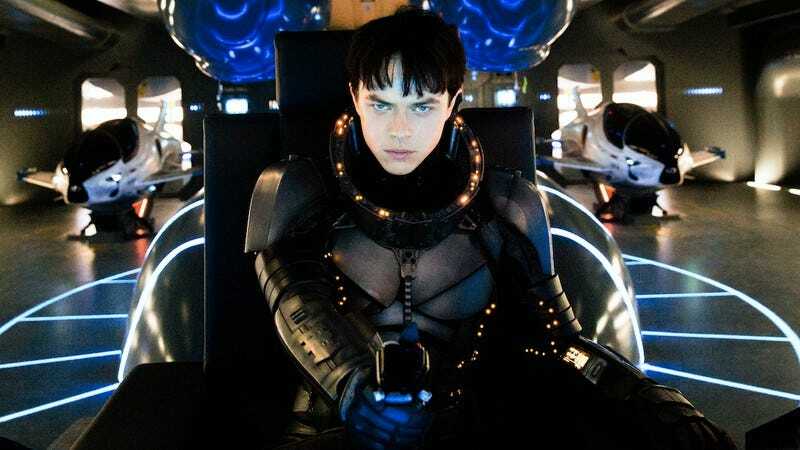 Luc Besson believes his upcoming film, Valerian And The City Of A Thousand Planets, will be fodder for obsessive rewatching. “I’m sorry, you can’t watch the film once. It’s impossible,” he told reporters at a breakfast in New York Monday. ”You have to go twice.” The assertion makes sense; chat even briefly with Besson, and you’ll hear about how dedicated he was to fully crafting a world based on the French comics he grew up reading. Besson explained that he had 6,000 drawings that he would show to his actors when they were shooting something on blue screen. “So I feed them with the world,” he said. “Every time they go to a world, they know exactly everything.” He also compiled a tome about the history of the space station Alpha, the actual city of a thousand planets that is threatened in the movie, requiring heroes Valerian (Dane DeHaan) and Laureline (Cara Delevingne) to spring into action. “I have a bible of 100 pages about the construction of Alpha from 1972 to 2750,” he explained. “Every year, what happened on this thing: Who built what, which alien arrived at what date, where they come from some. Then I have 10 pages on each alien, where they come from, what they eat, how they reproduce, where they live, and actually in the bible if you take the address it’s a real address. You can go in the sky and you can see the address and that’s where they live.” According to Besson, there are more than 100 different kinds of creatures in the movie. Star Dane DeHaan, who plays the titular character, said “there were no quizzes” on the material, and he relied on Besson’s well of knowledge instead. ”The shoot was so much fun, I think in a lot of ways because Luc was having so much fun,” DeHaan added. A new trailer, which Besson promises just scratches the surface, is due out tomorrow.